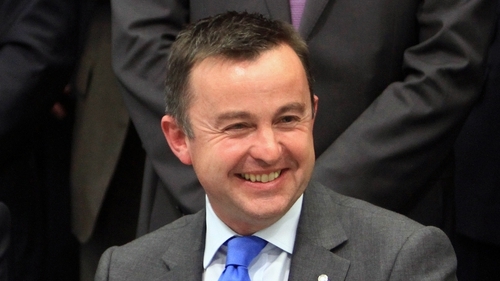 Fine Gael MEP Brian Hayes has announced that he will not contest the European Parliament elections next year. The high profile MEP for Dublin said he has made the decision for professional and family reasons. He told RTÉ’s Today with Sean O'Rourke programme that he informed the Taoiseach and Fine Gael leader Leo Varadkar of his decision yesterday. Mr Varadkar was very understanding, he said, and reminded Mr Hayes that he had once given an interview to Hot Press magazine vowing to leave politics before the age of 50. Mr Hayes, who is now 49 years old, will take up a role as CEO at Banking and Payments Federation Ireland next year. He has served as a Fine Gael TD, Senator, Minister of State and MEP since he was first appointed to the Seanad in 1995. Mr Hayes was also the Fine Gael Director of Elections for the general election campaign of 2016. Mr Varadkar said: "Politics' loss is private sector's gain. Sorry to see [Brian Hayes] leaving politics. "He's made a massive contribution to Fine Gael, Dublin and Ireland for more than 25 years." Mr Hayes said that he had fought eight different elections at national and European level and that "it was enough" and there was life after politics. For family and professional reasons, he said, now was a "good time to leave the stage". Mr Hayes will be taking over the Banking & Payments Federation Ireland role from interim CEO Maurice Crowley in April. Mr Crowley was appointed by the BPFI’s Council Executive Advisory Group in June of this year following the departure of Noel Brett. Jonathon Lowey, the President of BPFI, said that Mr Hayes' numerous posts over the past decade, including Deputy Finance Minister in 2011, Vice President of the Economic and Monetary Affairs Committee, and the EPP Vice Coordinator on the ECON Committee, make him the ideal candidate for the position.